Black walnuts (Juglans nigra) are a very beneficial tree that provides high-quality wood, sap, food via the nuts that it bears, and dye. 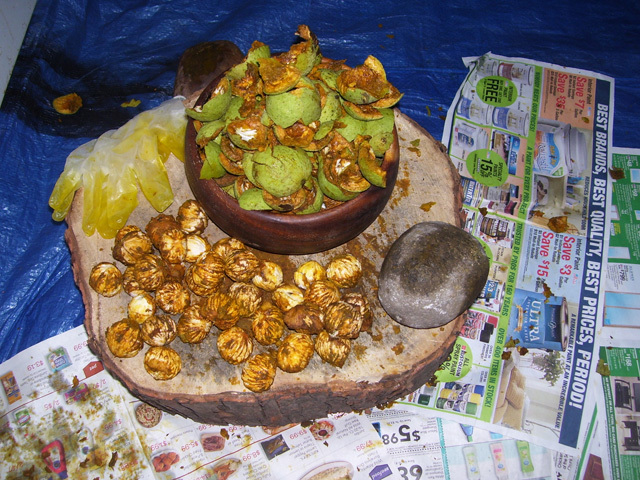 The dye is produced from the green husk that encases the seed. 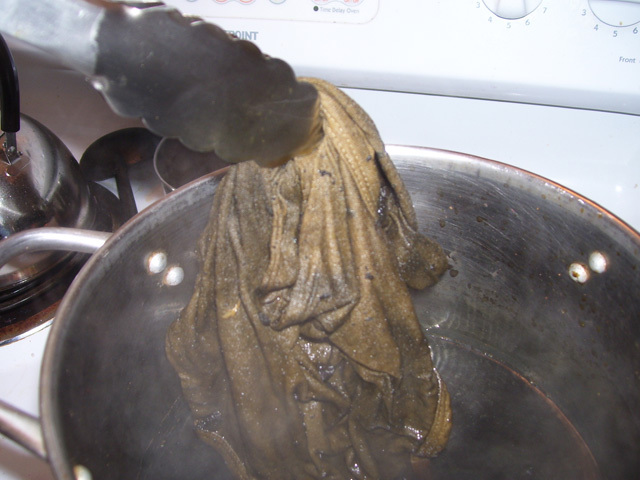 This dye yields a rich dark brown-green or red-brown color. The dye can also be made into ink for drawing and writing, and to color hair. 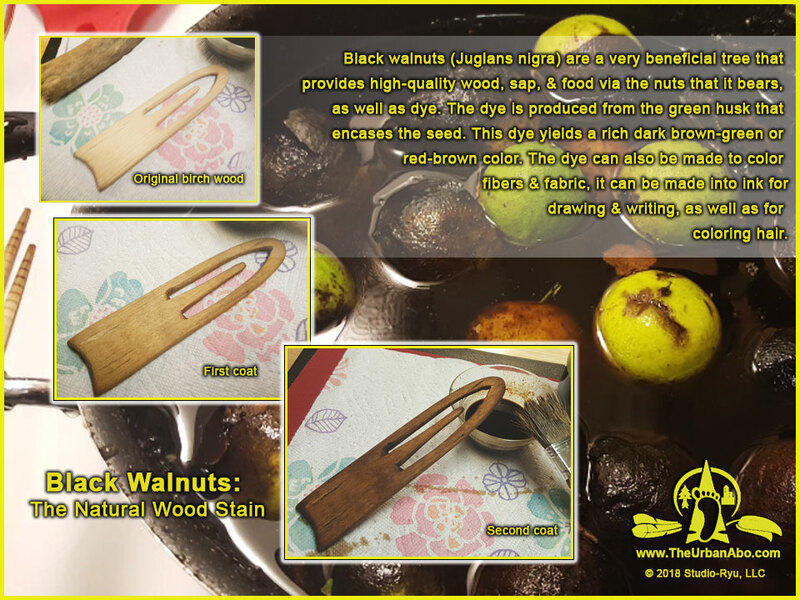 This is also a quick and DIRTY way of making wood stain using the nuts of the Black Walnut tree. 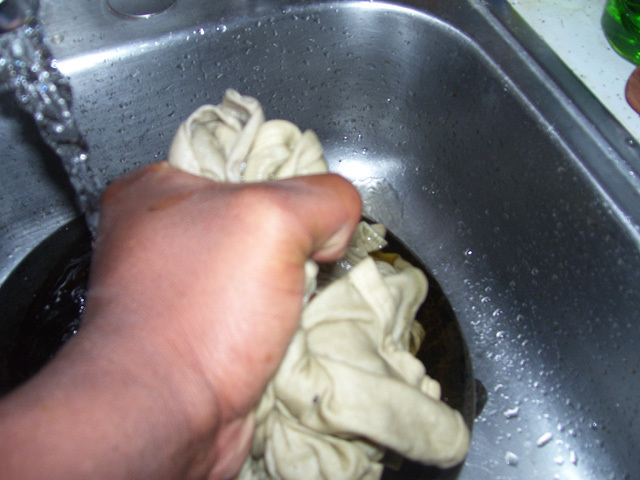 It is not difficult to make but be mindful to wear gloves and to be careful to not stain things and areas you do not want to discolor. Bring to a boil, then simmer for about an hour to render down. Strain out the nuts and husks for the liquid. Add 2T of vinegar to help prolong shelf-life. Storing in the refrigerator until use is best. 1). 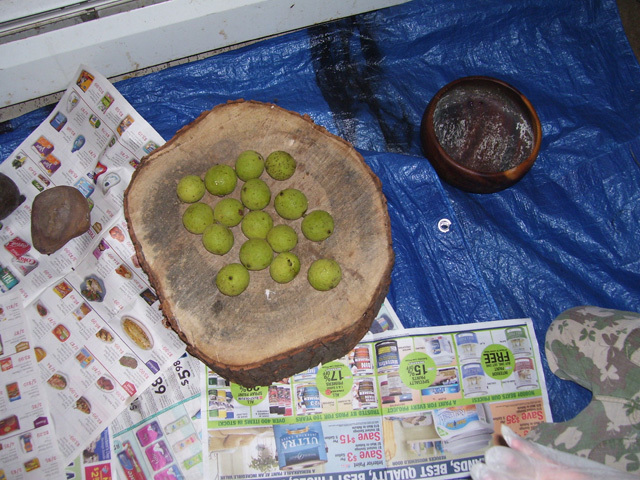 Harvest 12 – 18 black walnuts with the green husks intact. My understanding is that green-husked walnuts do not keep, they will start to turn black. These were kept in the refrigerator for about 4 days before processing. Also, the nut inside is perishable as well and may begin to mold if stored after de-husking. 2). Be sure that your surface areas including your hands are well covered and protected. 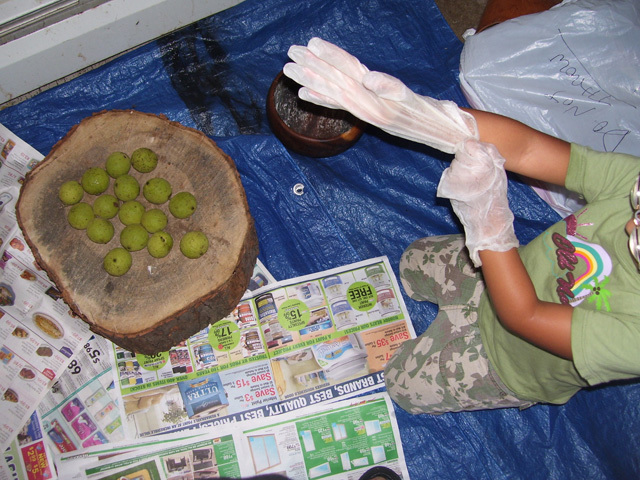 Black walnuts stain quite readily. Here, we have laid a tarp down partially covered with newspaper. 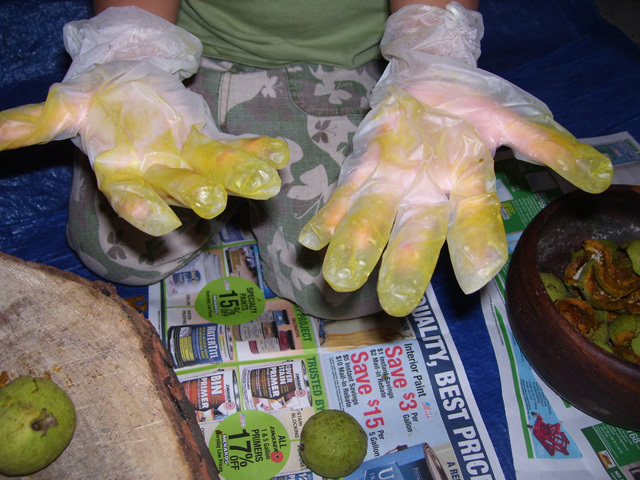 Be sure to wear gloves, and clothing you do not mind getting stained. 3). 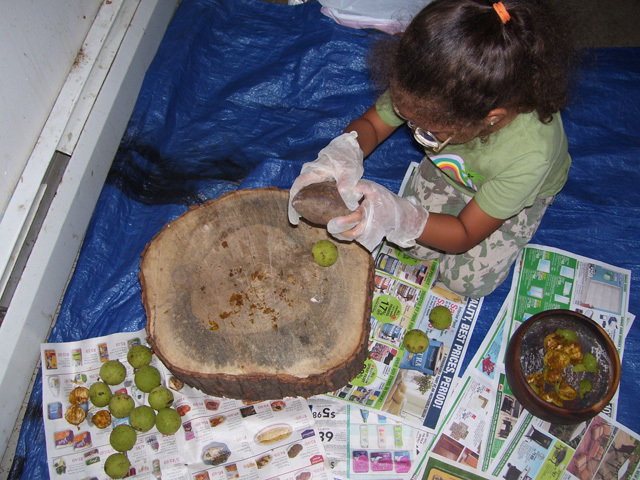 Take a rock, mallet, or hammer and break away the green husk from the walnut seed. The husk is what we need for the dye. Wearing protective eyewear would be a good idea as well for this. 5). Notice how the husk starts to stain even the gloves she is wearing. 6). Next heat about a gallon of water and bring it to a boil in stainless steel or enamelware pot. Add the husks, let boil for about 3 -5 minutes then reduce heat to a simmer. After the water has tuned a rich dark brown you are ready to submerge your garment in the dye. 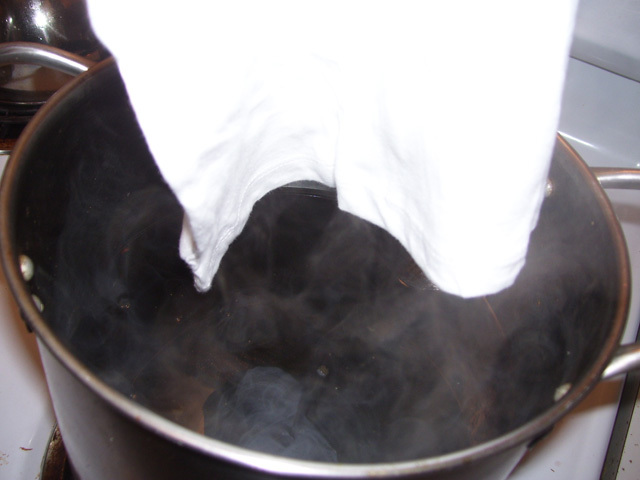 You garment should have been "scoured" by boiling it for an hour or two in 1 TBSP of washing soda and 1/2 tsp of detergent per 1 gallon of water before hand. Be sure to rinse the garment thoroughly after the scouring bath under running water. 8). Next, rinse out the excess dye under running water. Be sure to use tongs and not scald yourself with the hot water. 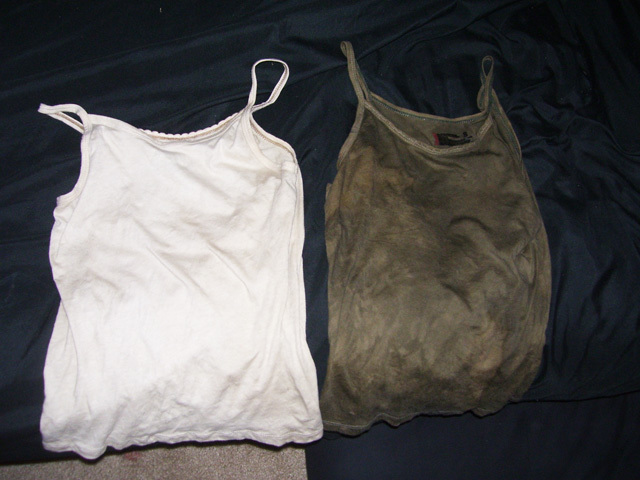 In this picture this shirt was only simmered in the dye a very short time, thus the light color. 9). You can see the contrast between the white before, and dyed after shirts.. Be sure to checkout Eddie Starnater’s site for more info and details. 10). 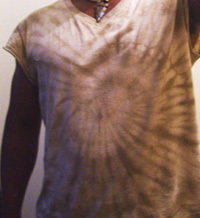 Here is one of the t-shirts I walnut tie-dyed and after a wash. Much more vibrant in person. Be sure to check out this site for tie-dye tutorials and ideas here.